We often assume there will be time to find out more from our older loved ones, but that is often a mistake. Last year Elizabeth was able to bring her great-grandfather, a World War II Navy veteran, to her school’s Veterans’ Day program. It was during this event that I realized we knew very little about Pa’s service and I began asking questions. 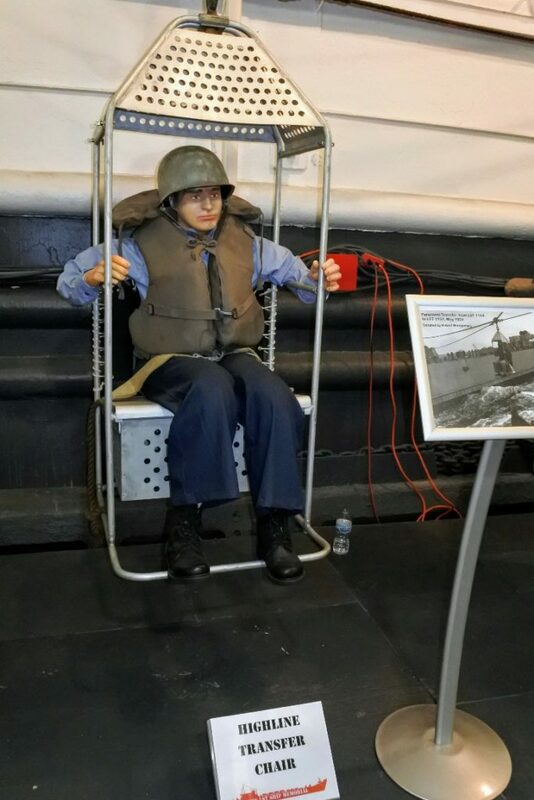 He told us he served on a LST, which is the type of ship that famously landed on the beaches of Normandy on D-Day. 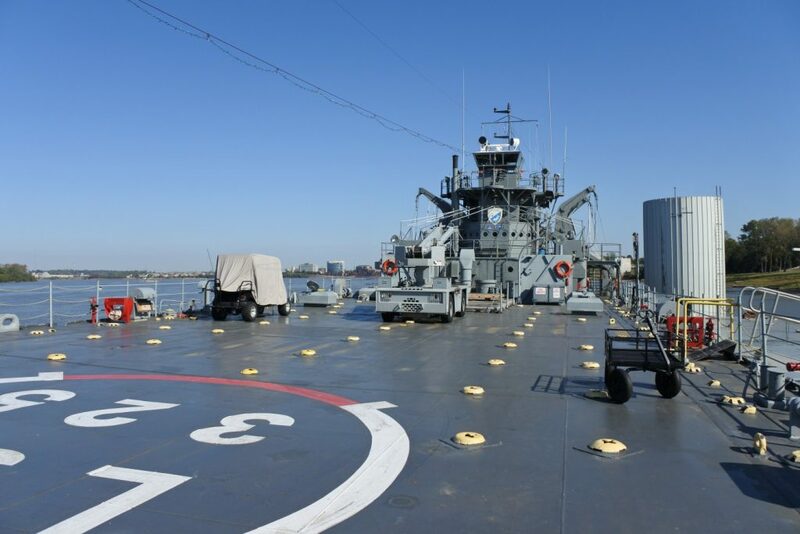 Luckily for us USS LST 325, a lovingly restored and functional ship, is a LST museum in Evansville, Indiana! 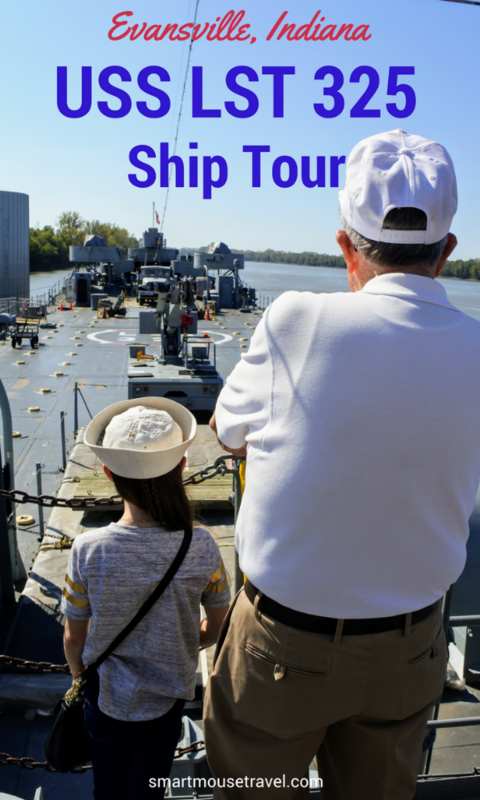 We then planned a four generation family trip to tour LST 325 with Pa.
LST stands for “Landing Ship, Tank”. LSTs were integral in many key battles in World War II, the Korean War and Vietnam. LSTs held 90-100 crew members, 200-400 troops, 20 tanks, 30-40 vehicles and other supplies needed to make a land invasion in enemy territory. The ship would approach land during high tide and intentionally run onto the beach. Tanks, equipment and troops were unloaded from a ramp on the front of the ship. The remaining crew had to wait for sea levels to rise again to move the ships off the coast. Ships never traveled empty and were often reloaded with POW or wounded US military personnel. LSTs almost always worked in groups. Since LSTs traveled together there was something called the “highline transfer chair” that could transfer small items from one ship to another. This chair would use a rope and pulley system to transport a man from one ship to the other while out at sea. I would not want to be that guy! Pa remembers them using it to transfer movie reels from ship to ship. Where Can I Find LST 325? USS LST 325 has a home dock in Evansville, Indiana on the Ohio River. However, as a fully functioning ship it does occasionally leave Evansville and dock elsewhere. When the LST 325 Memorial is traveling elsewhere tours are still provided (for a fee) at the temporary dock. Some past tours have had stops in Hannibal, Missouri and Nashville, Tennessee. Pro tip: Make sure you check the online calendar to make sure LST 325 is in Evansville, Indiana on the dates you intend to visit. The ship may also close for inclement weather or private events so call ahead to confirm tour hours. LST 325 measures 327 ft long and earned 2 battle stars, one for Sicily and one for Normandy. In fact, you can find several pictures online of LST 325 on the shores of Normandy. Tours are generally provided once an hour on the hour with the last tour of the day departing at 3 p.m. Hours vary by day of the day of the week and season so check here when planning your visit. The LST 325 tour takes an hour. 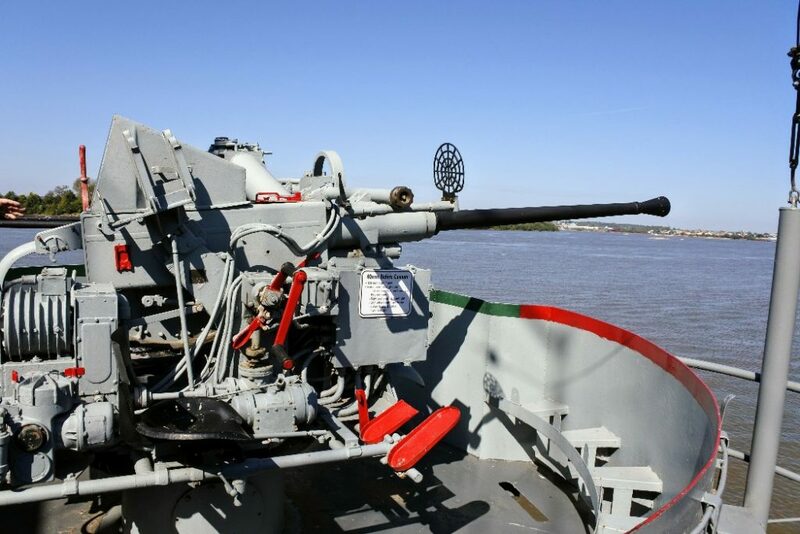 The tour takes you from the deck of the ship, down into the bay where tanks were loaded for deployment, through the galley, mess hall, officer’s areas, and past the large artillery guns. Your volunteer tour guide will teach you much about the history of LSTs and what daily operations looked like on this type of ship. These guys know their stuff and are happy to answer any questions you have. You can even see a “movie star” while visiting LST 325. 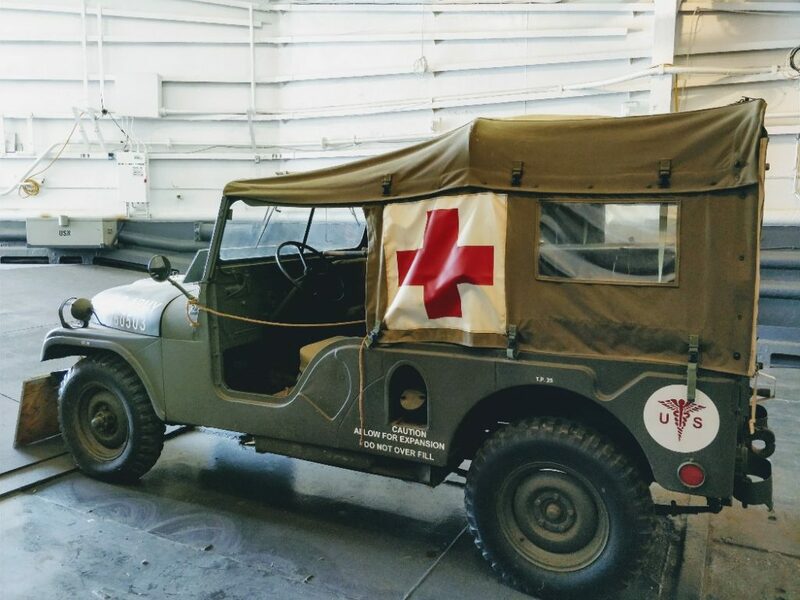 A MASH jeep from the movie is restored and located in the bay of the ship. There is also a gift shop and small USS LST 325 museum with memorabilia located where you purchase tour tickets. I contacted LST 325 in advance of our visit. I told them that we would be visiting with my grandfather who served on USS LST 951 during World War II. They knew there were several large tour groups visiting on our day, but found an additional volunteer to give Pa a private tour. This was such an amazing treat! It allowed Pa to tell us stories about the ship as we went through and even the tour guide learned a couple of tidbits. Our volunteer also presented Pa with a framed copy of the only known photograph of his ship and a framed information sheet with key facts about LST 951. Pro tip: If you visit LST 325 with a LST veteran make sure to call ahead. Let the staff know your plans and also provide the ship the veteran served on if possible. They may be able to find something special for your veteran, too, but know there are no guarantees. LST 325 was one of the ships that landed on the beaches of Normandy during D-Day. The ship was decommissioned by the U.S. Navy twice. LST 325 served in the Greek Navy for 36 years after being decommissioned by the U.S. Navy. A volunteer crew of 29 men departed Crete, Greece July 17, 2000 and arrived January 10, 2001 in Mobile, Alabama after sailing LST 325 across the Atlantic Ocean. The average age of the men that brought LST 325 back in 2000-2001 was 72 years old. 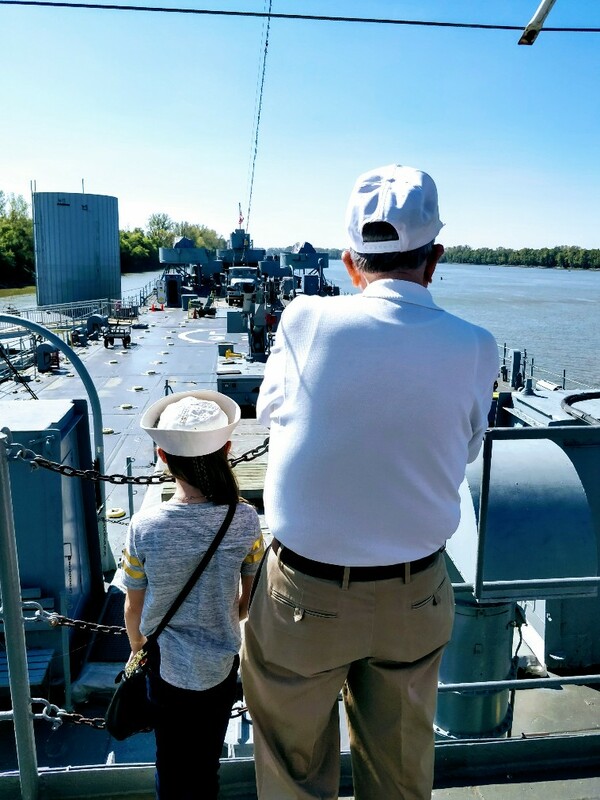 Visiting LST 325 with our LST WWII veteran will be one of those memories that we will always cherish. If you have the opportunity to go with your own LST veteran I highly, highly recommend it. Don’t have a LST veteran? Go anyway. The uniqueness of this Navy ship will blow you away. I was fascinated how these ships were used as a deployment tool for tanks and troops. This concept is so hard to imagine in modern warfare. These LSTs also operated as mobile hospitals and after the war as a way to salvage lost equipment. Many ships also went on to serve in the navy of other nations. All this history and utility packed into 327 feet of ship that was considered a success if it landed twice. Amazing! Next Post:Is Mickey’s Very Merry Christmas Party Worth The Expense?